No one will accuse Aaron Boone of sleeping on the job. 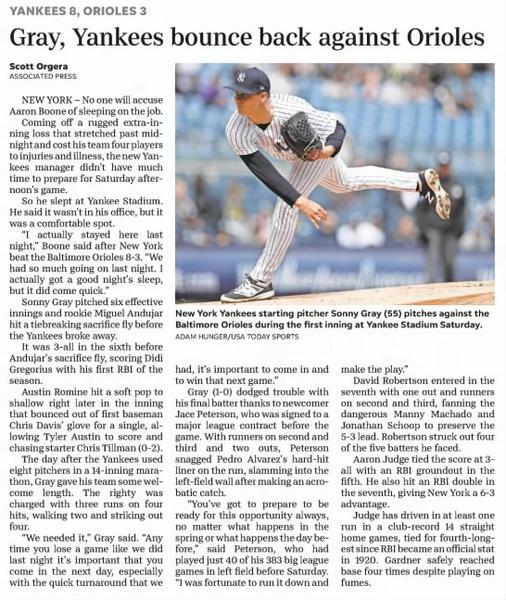 Coming oﬀ a rugged extra-inning loss that stretched past midnight and cost his team four players to injuries and illness, the new Yankees manager didn’t have much time to prepare for Saturday afternoon’s game. No one will accuse Aaron Boone of sleeping on the job. Coming off a rugged extra-inning loss that stretched past midnight and cost his team four players to injuries and illness, the new Yankees manager didn't have much time to prepare for Saturday afternoon's game. 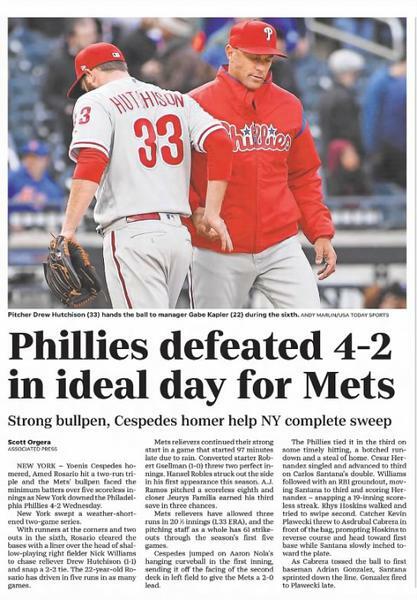 Yoenis Cespedes homered, Amed Rosario hit a two-run triple and the Mets' bullpen faced the minimum batters over five scoreless innings as New York downed the Philadelphia Phillies 4-2 Wednesday. 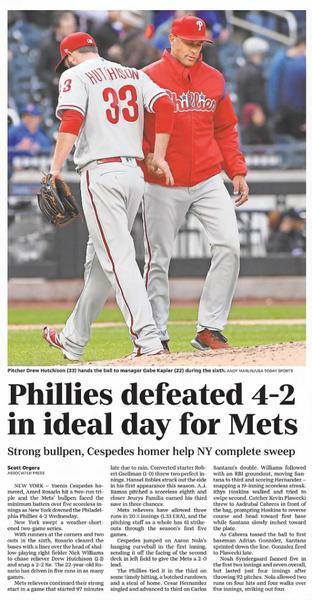 Yoenis Cespedes homered, Amed Rosario hit a two-run triple and the Mets’ bullpen faced the minimum batters over ﬁve scoreless innings as New York downed the Philadelphia Phillies 4-2 Wednesday. Coming oﬀ a 70-92 season, the New York Mets hired a new manager and hoped for better luck this year. 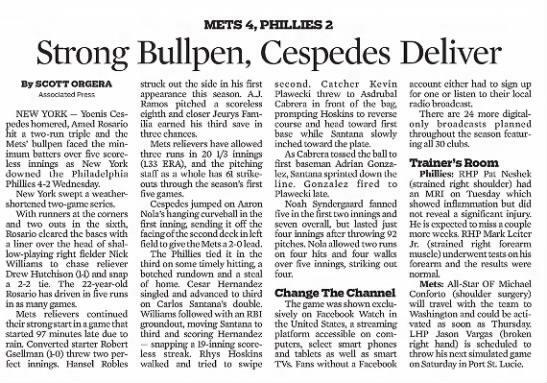 And Mickey Callaway became the ﬁrst Mets skipper to win his ﬁrst two games since player-manager Joe Torre did it when he took over during the 1977 season. 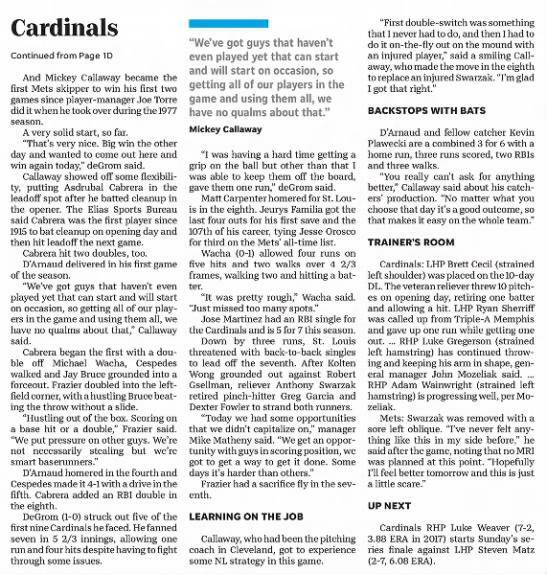 Coming off a 70-92 season, the New York Mets hired a new manager and hoped for better luck this year. Even though it's still really early, this is what they envisioned. The jury is out on AL MVP. 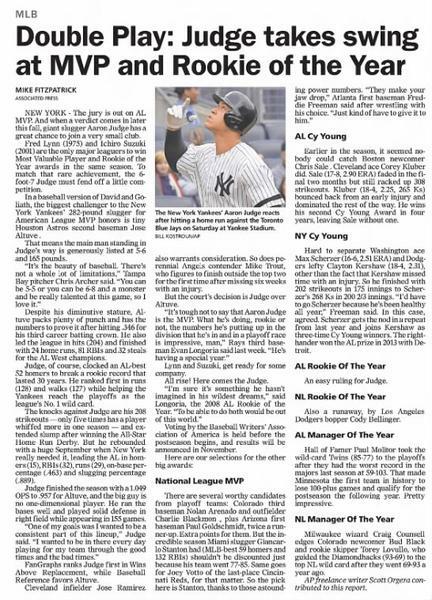 And when a verdict comes in later this fall, giant slugger Aaron Judge has a great chance to join a very small club. 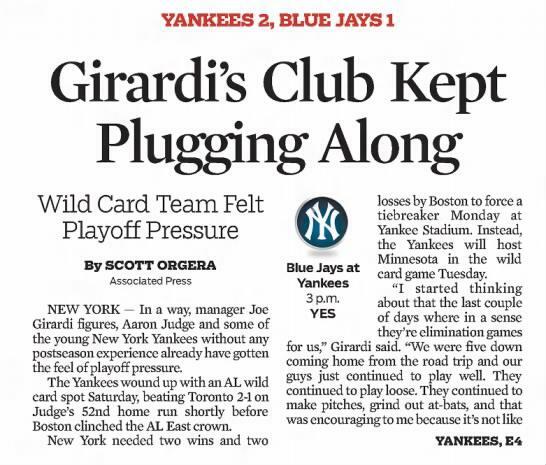 In a way, manager Joe Girardi figures, Aaron Judge and some of the young New York Yankees without any postseason experience already have gotten the feel of playoff pressure. The wild card winner will face Cleveland in the best-of-five AL Division Series. Boston, which beat Houston about 20 minutes after the Yankees won, is set to take on the Astros in the playoffs. 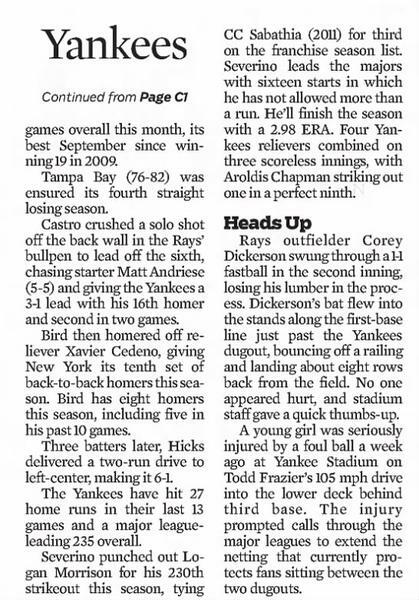 Castro crushed a solo shot off the back wall in the Rays' bullpen to lead off the sixth, chasing starter Matt Andriese (5-5) and giving the Yankees a 3-1 lead with his 16th homer and second in two games. 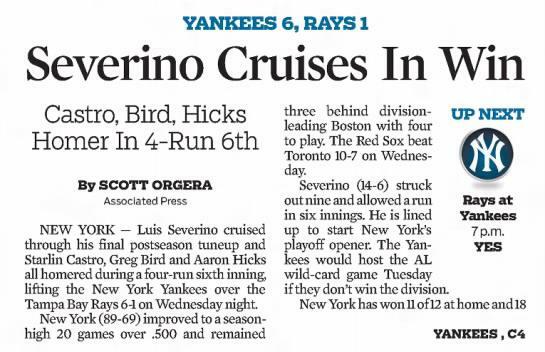 Didi Gregorius and Greg Bird both homered for the second straight game, rookie Jordan Montgomery pitched six shutout innings, and the New York Yankees downed the Baltimore Orioles 9-3 Saturday for their fourth win in a row. Baltimore has lost nine of 10 as it continues to fall out of playoff contention. Montgomery (8-7) scattered four hits in his fifth start against the Orioles this year. 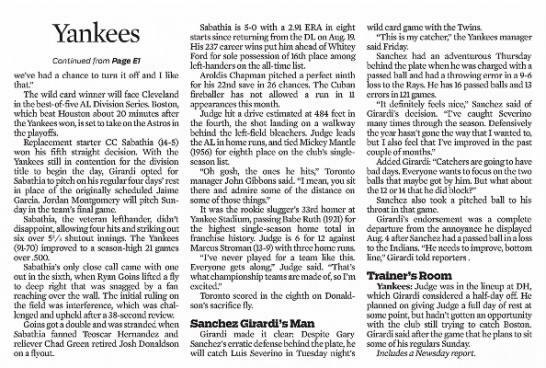 A day after CC Sabathia sounded off on a Boston bunt, small ball was still causing a big back-and-forth between the New York Yankees and Red Sox. 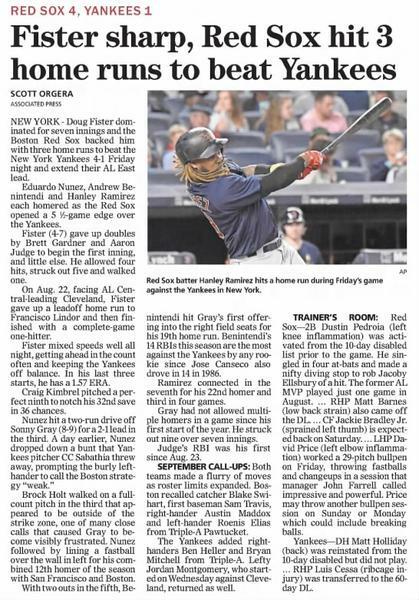 Doug Fister dominated for seven innings and the Boston Red Sox backed him with three home runs to beat the New York Yankees 4-1 Friday night and extend their AL East lead. 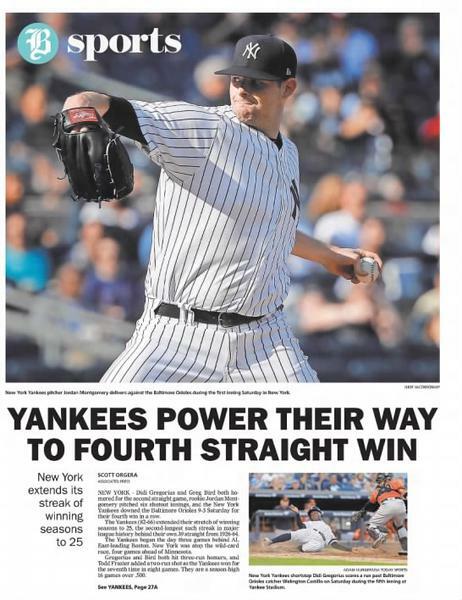 A day after CC Sabathia sounded off on a Boston bunt, small ball was still causing a big back-and-forth between the New York Yankees and Red Sox. Sabathia got riled Thursday night when Eduardo Nunez dropped a bunt, which the pitcher threw away for an error. J.T. 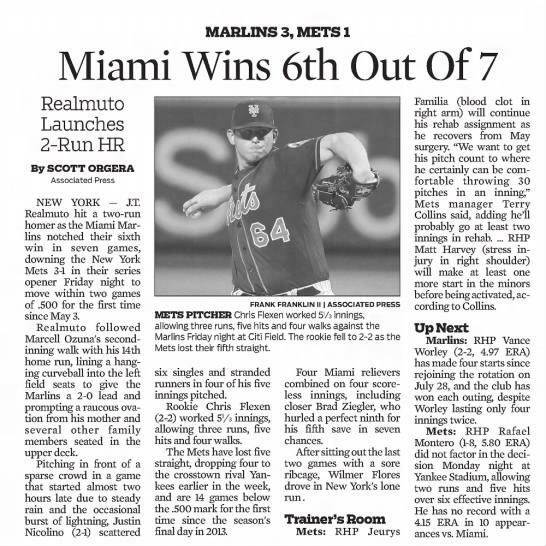 Realmuto hit a two-run homer as the Miami Marlins notched their sixth win in seven games, downing the New York Mets 3-1 in their series opener Friday night to move within two games of .500 for the first time since May 3.